The Daredevil Ultimate ‘175 Gram Gamedisc’ has been used in gameplay throughout the world since 2002. It has the elite status of ‘Championship Level Approval’ by USA Ultimate, the govering body of the sport. Designed by ultimate players, these official high quality sport discs are manufactured and printed in Ottawa, Ontario, Canada. These ‘gamediscs’ can also be customized with your team, tournament or organizations logo. Check out our ‘Customize’ section for more details! Whether you are competing in a tournament or enjoying a day at the beach. Pick up one of these discs in our ‘Shop’ section or from one of our retail partners in your area and have fun! 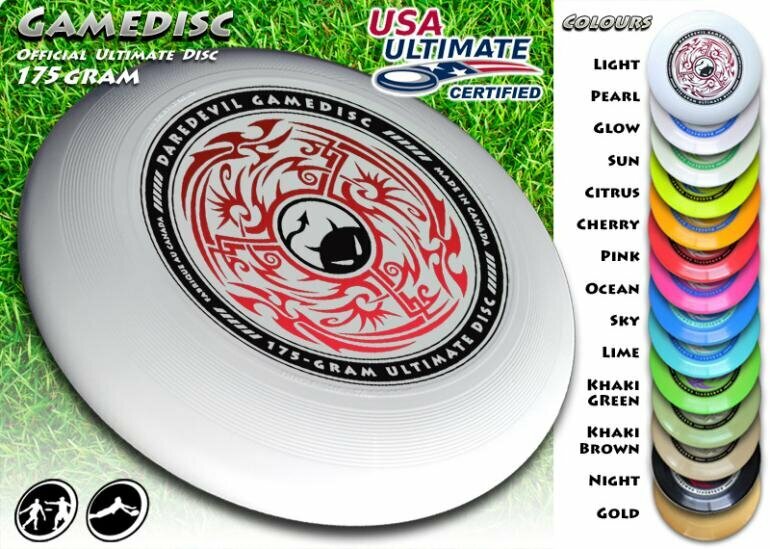 Den officielle disc til Ultimate Frisbee. Svæver stabilt og præcist og er let at gribe. En perfekt disc både til spil og til leg. Den officielle frisbee til Junior Ultimate i USA. Den har samme høje kvalitet som Ultrastar, men blot lettere og med mindre diameter. Perfekt til yngre hænder, strand og leg i haven.